For decades the narrative about Northern Ireland has been that it was an incomprehensible medieval conflict between the two warring groups – the Catholic tribe and the Protestant tribe. Foreign media reports were laced with references to religious fanatics attacking each other. The North, and especially Belfast, was portrayed as one more example of the pernicious role of religion, dividing people and even motivating them to kill one another. But last week’s State visit by Queen Elizabeth II accepted what the Good Friday Agreement of 1998 had clearly recognised – the conflict was never primarily a religious or confessional conflict but one caused by the tensions between Britishness and Irishness. It was part of the ‘long, complex and … often … turbulent’ relationships between two nations, most painfully incarnated in Northern Ireland. This was not two states trying to circumvent the results of religious fanaticism. It was two peoples accepting how their enmity and coldness had cost so much blood. And wherever armed forces fight, it is innocent civilians who suffer most. Religion was used as a weapon in the ebb and flow of that brutal tide of violence. But it was good to see civic authorities publicly acknowledging where the core problem lay. And I’d go further. The events of last week were led by two heads of State, both women of faith. Without talking about either religion or their own personal beliefs, they had the imagination and the courage ‘to bow to the past, but not be bound by it’, a chance to acknowledge ‘that while we cannot change the past, we have chosen to change the future’. President McAleese and Queen Elizabeth had the conviction and humility to be leaders, bringing their increasingly secular societies to a place which they could not reach on their own. They demonstrated that ‘spiritual intelligence’ which can take the rubble of the past and make it into foundations rather than a weapons cache. Could I even suggest that their personal faith convictions were a huge asset in developing the reflective and sacred dimension of the Dublin events at the Garden of Remembrance and the Irish National War Memorial Park. These became symbolic events which effected in many people’s hearts what they proclaimed in gesture and silence. This was ritual taking us beyond the limits of language to the unchartered edges of meaning. And there is another point. What happened last week was at least partly the result of what some people of faith had done to help the people of these islands come to terms with the ‘complexity of our history’ and the horrific outworkings of that fraught relationship. Those faith leaders who attended the State dinner actually represented all those who had worked tirelessly to liberate many of the political forces from the corners into which they had painted themselves. This was a tribute to those who worked to build peace while armed groups fought and politicians refused to talk. This was faith enriching the public forum, like leaven serving the common good, not intruding on someone else’s business. So what might this imply? Churches may have implicitly been removed from being identified as being responsible for past difficulties and as enemies of the future. But the visit also challenges the churches to re-examine our role in northern society. Firstly, it generates a new sense of freedom. If the conflict was seen as religious, then it was easy to portray anyone who used the name ‘Protestant’ or ‘Catholic’ as inherently sectarian, a relic of the past, as something that had no place in modern society, a title to be avoided in company. For example, Catholic schools could be labelled as merely divisive because they dared to espouse the name of one of the warring tribes. I hope that the events of last week will enable people to be proud of their identity and contribution to a modern society, rather than having to apologise for it. The visit also gives churches an opportunity to reassert their independence from those political and economic forces that would seek to enlist them on their side. Secondly, the rich symbolism of the visit may help us all to move beyond the stage where we thought that we could own truth – about history, about God and about ourselves. It questions comfortable narratives about our religion – or lack of it – and our politics. But that does not mean that we abandon the search for truth. It just suggests that we can move beyond the fear that hardens genuine insight into ideology. It means journeying in trust, believing that the truth will not enslave us but set us free. Thirdly, one of the key sources of conflict has always been those who quarry the past to promote, not pride, but a sense of injustice. The pain has to be acknowledged but the past cannot be undone. Better than most, we ought to have discovered that there is no future if we seek only to punish the perpetrators and vent our righteous fury on the enemy, the oppressor. That endless search for redemptive violence, that urge to believe that satisfying vengeance or the spilling of blood for my pain will build a future – that is a futile hope and we have lived through the effects of that inhuman heresy. Too many people have suffered when there is – as Yeats suggested – more substance in our enmities than in our love. 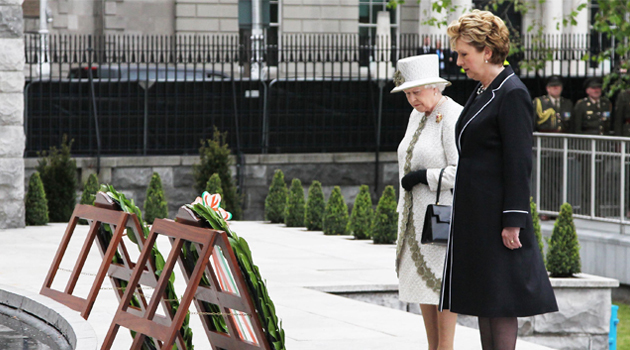 As one who seeks to follow Jesus, I remain intrigued so many by how many our key events – the Easter Rising, the Good Friday Agreement and now this visit by Queen Elizabeth during this Easter season – have occurred at a time of the year when Christians celebrate Jesus’ death and resurrection. The early Church had to retell the Jesus story in a way that made sense of the past and generated energy for the future. Last week’s events have given us a chance to tell a new truth that strikes a balance between wallowing in the past and forgetting about it. If faith communities can help generate space to tell our stories without fear of attack, then we can craft a new story in a place where hope thrives and the past no longer threatens to overwhelm our present and our future.